Forget a multiple choice test! Engage your students with this formative assessment piece! 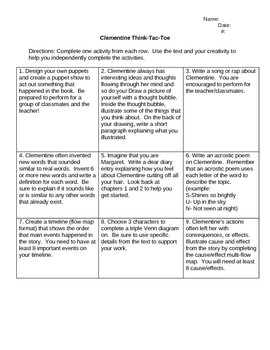 Students demonstrate and apply their understanding of the novel, Clementine, by choosing 3 out of 9 options to complete a project on. They will choose 1 activity from a different row, ensuring that their project will include art, writing, and thinking maps. A great piece to add to student portfolios or to show off at open house or student-led conferences!